Even man’s best friend is not immune to developing allergies, usually to the ingredients found in their food. If your pup is frequently sneezing, itching, or showing signs of (more than usual) abnormal behaviors, they may be having a bad reaction to something in their food. A hypoallergenic dog food usually limits the number of ingredients found in the food mix. With a focus on just one or two proteins and a grain elimination, it becomes easier for concerned dog owners to find an allergy-friendly meal for their four-legged family member. Not all dogs will need a hypoallergenic dog food but a possible allergy or food intolerance should not go ignored. We love our animals like we love our children. They are our babies and dealing with a sick puppy can be just as heartbreaking as dealing with a sick baby. Food allergies and intolerances can be very serious, even in animals. If you would never consider feeding your child something they were allergic to, why would you treat your dog any different? Champion Pet Foods - Misc. When it comes to dealing with a food allergy, the signs and symptoms that appear are very similar to those a human would show. Also like a human, the severity of the allergy would determine what kinds of symptoms the animal has and how prominent those signs would be. Some common symptoms to a food allergy involve the dog’s skin, which can sometimes be difficult to see because of their fur. A food allergy can present itself in the form of a rash or hives on the animal’s skin, causing discomfort and itchiness. If you cannot see your dog’s skin easily and you see them itching or biting, check the area and see if there is irritation. An allergic reaction in dogs can also appear as diarrhea or chronic gas. They may also show their reaction with strange behaviors, like constantly shaking their head or licking their feet. An allergic reaction is the cause of a number of different factors, but there is almost always a genetic component that influences the dog to be more prone to allergies or intolerances. If your pup was on antibiotics for whatever reason when they were small, they may be more likely to have allergies or intolerances to food because antibiotics can change the gut. A food allergy and a food intolerance are not the same thing. If your dog is suffering from one or the other, you’ll want to determine if it is an allergy or an intolerance. If your four-legged friend has an allergy, it means that the immune system is negatively reacting to something in the body. Although some allergies only cause itching or sneezing, a serious food allergy could be very life-threatening for your animal. If your dog has a food allergy, you’ll want to do your best to completely avoid foods or snacks that contain those ingredients – no matter how severe the allergy is. It can always get worse. A food intolerance is different than a food allergy. Where a food allergy can be life-threatening, a food intolerance means that the body cannot digest something the animal has eaten. This may cause your pup to be a little uncomfortable while the intolerable ingredient is finding its way out of the body, but it is usually removed by vomiting or in the bowels. A food intolerance is known to cause diarrhea, which can be uncomfortable and messy for both you and your dog, so while it doesn’t need to be approached with the same caution that a food allergy does, you’ll still want to do your best to ensure your dog doesn’t scarf up something with an intolerable bit of food. If you have a dog with a food allergy or food intolerance, you want to be really careful about dropping foods or your children slipping bites at the dinner table. We all know that our dogs are basically the equivalent of living vacuums. They don’t care if they are allergic or intolerant to something. They’re still going to eat it. It is your responsibility to ensure they aren’t exposed to foods that can hurt them. These foods are very common in dog foods and treats, so you need to be sure to read the ingredients lists of everything you purchase for your pup. If a dog is allergic to one food, there is a good possibility they are allergic to others. If you’re not sure what your dog is allergic to, start focusing on foods that have only one source of protein. If their current dog food has chicken, fish and beef and they aren’t reacting well, pick up a food that has only one. If they continue to react, you’ll know which ingredient is triggering the reaction. Dogs may also develop a food allergy later in life. Even if you’ve fed something to them their entire life, their body may decide it doesn’t like it whenever it wants. As a dog owner, you’ll always want to manage your dog’s response to food, regardless of how old the animal is. You will want to put your four-legged best friend on a limited ingredient dog food as soon as you realize that it might be having an allergic reaction. Once you can determine what exactly is causing the allergy, you’ll have an easier time preventing your living vacuum from eating something their body doesn’t like. An elimination diet is one of the best ways to determine what your animal is allergic to. Starting from the dog’s original diet, you should look at the possible culprits. Then focus on just one ingredient to feed your dog. If they still react, change the ingredient. You can keep adding new ingredients as long as the dog does not react. You will need to continue changing the dog mix until you find something that doesn’t cause a reaction. Rabbit and fish are good places to start because they are less likely to cause a reaction. If you’re looking for a hypoallergenic food to give your dog, here are five of the best dog foods for allergies. The formulas are limited ingredient, so you won’t need to worry about bits of allergens hiding among a long list of ingredients. The Wellness Simple Natural Limited Ingredient Dry Dog Food is mainly comprised of Salmon and Potato. As a single protein food, owners are able to alienate the ingredients that their dogs do not react well with. 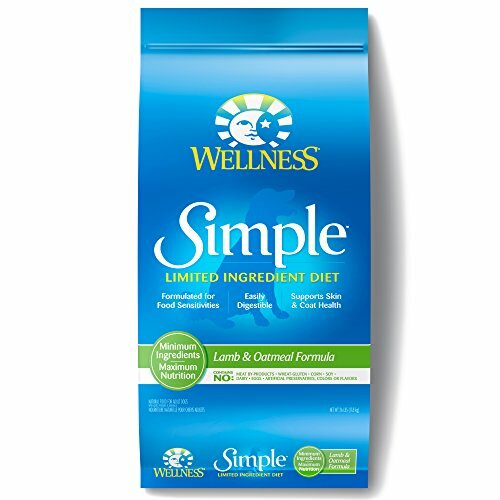 Because Wellness Simple Natural Limited Ingredient Dry Dog Food is also all natural, it does not contain gluten, wheat or any fillers and artificial additives. This line of dog food also comes in the following flavors: Duck & Oatmeal, Healthy Weight Salmon & Peas, Lamb & Oatmeal, Small Breed Salmon & Potato, and Turkey & Potato. Unfortunately, it does not contain flavors that use beef or chicken, so if your pet has an allergy to salmon, turkey, duck, or lamb, this might not be the brand for you. The main ingredients in Acana Duck and Bartlett Pear Dry Dog Food is duck and pear, two relatively uncommon ingredients that your dog is unlikely to have an allergy to. The Acana Duck and Bartlett Pear Dry Dog Food also has a low glycemic index and is low in carbohydrates, with local friends and vegetables. Other ingredients include: duck meal, deboned duck, steel-cut oats, peas, whole pears, whole potato, duck fat, duck liver, sun-cured alfalfa, and oat flakes. 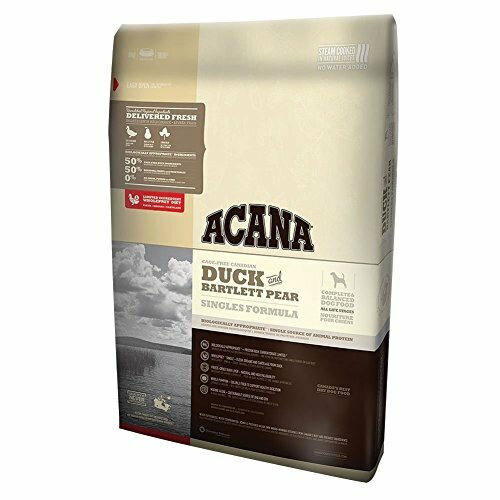 If your dog does not digest oatmeal well, the Acanda Duck and Bartlett Pear Dry Dog Food should not be considered. The Acanda Duck and Barlett Pear Dry Dog Food is also designed for adult dogs, meaning it may not be recommended for puppies and younger dogs. 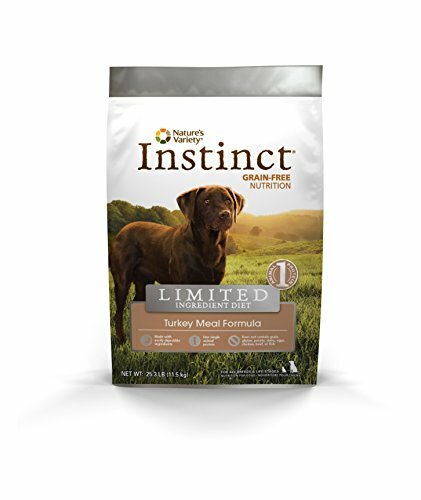 As a limited ingredient dog food, the Nature’s Variety Instinct Limited Ingredient Diet Grain-Free Dry Dog Food comes in three different flavors: Duck, Lamb & Peas, and Turkey. While these are the only flavors of the Nature’s Variety Instinct Limited Ingredient Diet Grain-Free Dry Dog Food, they are unlikely to cause allergies or problems in dogs, so there is a good chance that one of the kinds will appeal to your animal and their dietary restrictions. The Nature’s Variety Instinct Limited Ingredient Diet Grain-Free Dry Dog Food was developed with a gluten intolerance in mind. This kind of dog food does not contain any grains or gluten, so it is easily and comfortably digested for animals that may need to be gluten-free. This dog food is also free of other potentially allergy-inducing foods, including potato, diary, eggs, chicken, beef and fish. The Nature’s Variety Instinct Limited Ingredient Diet Grain-Free Dry Dog Food can be given to all dogs, no matter the age or breed. With a medium-sized kibble, it can be eaten perfectly easily by puppies, small breeds, senior dogs, or full grown large breeds. Unfortunately, the Nature’s Variety Instinct Limited Ingredient Diet Grain-Free Dry Dog Food does run on the expensive side, at around $70 for a 25-pound bag. 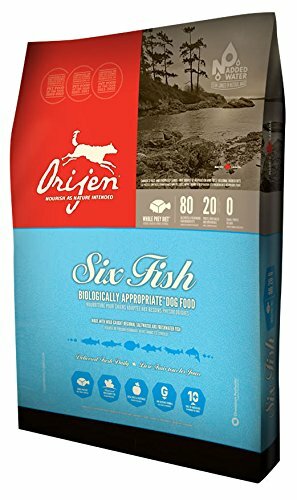 Because fish is one of the ingredients that dogs are not commonly allergic to, the Orijen 6 Fish Grain-Free Formula Dry Dog Food uses six different kinds of fish to deliver protein to the animal. In addition to both freshwater and saltwater fish caught in the lakes of Canada, the Orijen 6 Fish Grain-Free Formula Dry Dog Food contains fruits and berries. This dog food best fits animals that do not have any allergies towards fish. Because there are six different blends, any kind of aversion to fish can lead to an allergic reaction in the animal. The Orijen 6 Fish Grain-Free Formula Dry Dog Food is also one of the more expensive dog foods on this list. For a 28-pound bag of the dry dog food, it will cost over $100. The Pinnacle Grain Free Dog Food comes in a variety of flavors. Some of those offered include Chicken & Vegetable, Duck & Sweet Potato, Salmon & Potato, Trout & Sweet Potato, and Turkey & Potato. Rather than standard grains found in dog foods, the Pinnacle Grain Free Dog Food uses Quinoa seed to deliver the amino acids needed to muscle development. The Pinnacle Grain Free Dog Food also contains pumpkin, which can be a great source of antioxidants. 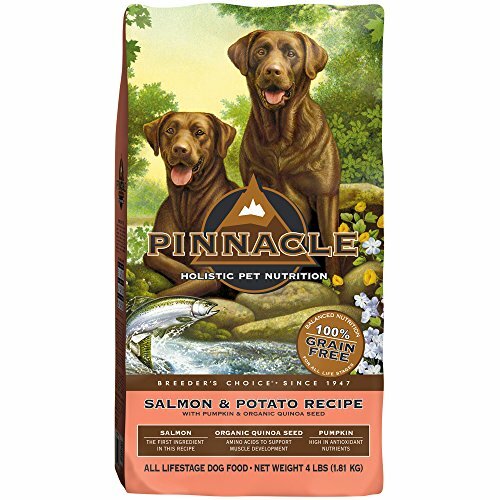 Because almost all of the flavors of the Pinnacle Grain Free Dog Food contains potato, it may not be the best option if your dog has a known intolerance to potato. The kibble size of the Pinnacle Grain Free Dog Food is a bit on the smaller size, so it may appeal best to puppies or small breeds. No one wants to watch their furry best friend struggle with foods that aren’t sitting well. While our pups may be tough and they may think everything around them (especially their owner’s shoes) make great snacks, food allergies and intolerances are not uncommon in dogs. Consider what is making them sick and do what you can to keep it out of their diets. One of my dogs has an allergic reaction to pork and chicken so I am careful in choosing the right food for her. We’re on eukanuba and so far, we never had issues with it. I think it’s good for dog’s with food allergy, it’s a shame it’s not included in the list. My little Boston is on Royal canine Anallergenic but I think he needs something different. Acana and Orijen (grain-free) are extremely popular with dog parents having similar problems with their dogs. They both have 4-5 star Amazon ratings with awesome reviews. Always consult with your veterinarian first, and take your dog in for a check-up to eliminate any other health problems. Your veterinarian may give her medication to help with her itching, and will discuss other dog food options with you. I would not use any dog food that has oats of any type because of the high concentration of glyphosate in it. Dogs do not need any potato except maybe sweet nor alfalfa which is for herbivores. The USA plant that makes dog food for us puts alfalfa in their products while the Canadian manufacturer does not and Canada will not ship to the USA anymore. Thanks for connecting to Mysweetpuppy.net. Please keep in mind that I, Claudia Bensimoun, do not write any of the blogs or reviews on this website, nor have I in the past. I only answer the comments section.Oats does have advantages too. It is a good alternative carbohydrate for dogs who are sensitive to wheat or other grains. Oats contains linoleic acid. This is a type of Omega-six fatty acid that helps maintain healthy skin and coat. Oats also are high in protein, and contain anti-inflammatory and soothing skin properties.They also have a calming effect on nervous dogs. That said, always consult with your veterinarian as to adding any new food product into your dog’s diet. Thanks for connecting to Mysweetpuppy.net. Please keep in mind that I, Claudia Bensimoun, do not write any of the blogs or reviews on this website, nor have I in the past. I only answer the comments section.Acana and Orijen are great grain-free dog food brands.Dog food formulas should contain antioxidants, Omega 3’s, healthy ingredients and a balanced diet for the appropriate life stage.Wellness Core Grain-Free puppy formula also provides some of the best in puppy pet food with holistic real- food ingredients that are free of added hormones and steroids.This puppy food is gluten-free, and contains salmon oil, a natural source of DHA, that helps support cognitive development. This puppy food also contains probiotics to help maintain a healthy digestive tract. My German Shepard is SEVERELY allergic to EVERYTHING including fish, kangaroo, duck, lamb, venison, etc. I am trying a squid dry formula at the moment. Does anyone have any suggestions? She’s constantly scratching and biting at herself. Thanks for connecting to Mysweetpuppy.net. Please keep in mind that I, Claudia Bensimoun, do not write any of the blogs or reviews on this website, nor have I in the past. I only answer the comments section.Signs of sensitivities or allergies to a protein source like chicken may suddenly arise. When you begin to notice skin and coat allergies, your first step would be to consult with your veterinarian. Hot spots and allergic responses, if treated immediately, have better outcomes. Greasy coats, hot spots, hair loss, excessive itching, lethargy, decreased appetite, and stomach problems are signs that your pooch will probably need a dietary change. Before switching dog food, consult with your veterinarian, and gradually switch over. That said, keep in mind that this should only be done after a veterinary consult, to rule out any other variables. What happens when dogs get allergies? Thanks for connecting to Mysweetpuppy.net. Please keep in mind that I, Claudia Bensimoun, do not write any of the blogs or reviews on this website, nor have I in the past. I only answer the comments section.I am in no way connected to the content written within this website, most especially the German Shepherd blog. This website hires other writers for their blogs.Please do not contact me regarding website content. I only write content within the comments section.What are The Symptoms of Dog Food Allergies in Puppies and Dogs? Dog food allergies in puppies and dogs occurs within one to two hours of food ingestion. It’s always best to consult with your veterinarian if you think that your dog is allergic to his dog food. Dog food allergies may result in inflammation of the stomach lining and intestines. Pups and adult dogs may be be prone to bouts of vomiting. .Unhealthy looking coat may result with severe cases of dog food allergies. This takes time to occur. Your puppy or adult dog may also develop dog food allergies after suffering from an intestinal infection. That said, you will need to consult with your veterinarian. Added probiotics like Probios are great for maintaining your dog’s digestive health. These are easy to use, and come in sachets. Feeding you puppy or adult dog a high-quality diet is important. A healthy diet will affect your dog’s behavior and intelligence, and helps with focus during puppy or dog training. It is also crucial for puppies. So How Do Pet Parents Choose a High-Quality Diet For Their Puppies and Dogs? .Feed a diet from a well-known, reputable company. Contact them with any questions of concern. .The labels on any puppy or dog food diet should meet the levels established by the AAFCO Control Officials and/ or feeding trials. .Feed puppies puppy food, and be sure to feed a large breed puppy a large breed puppy diet. .There is no “best diet.” Dogs are individuals. A diet that works for one dog may not be the best for another. Age, energy level and individual medical concerns play a large role for each puppy or dog. .The recommended guidelines on bags often contain more calories than dogs need. Unless it is a very energetic dog, feeding the lower end of the recommendation is best. Consult with your veterinarian for advice. .Feed a complete and balanced food for the appropriate life stage of the dog. The best dog foods are made with the simplest, and most nutritious ingredients. Look for high-quality ingredients such as whole meats, fruits, vegetables, and grains, and take heed of the different ratio of macronutrients- proteins, fats and carbs! Next, you’ll have to try out which one works best for your dog. Providing your puppy or adult dog with the most appropriate diet that is healthy and beneficial to his life stage will help you give your furry best friend a long and healthy life!Always ask yourself these questions: Is my puppy or adult/senior dog suffering from any health problems? What life stage is he or she at? Veterinarians recommend that dog parents have a better understanding of their dog’s health issues and life stage, before choosing a dog food. As usual always consult with your veterinarian for the best advice.